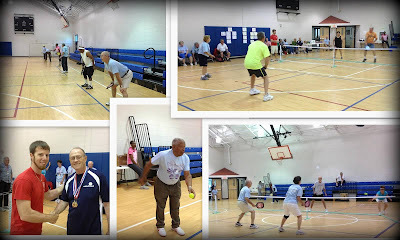 On Friday, April 26, 2013 Pickleball was held at the Hope Mills Recreation Center as part of the Mid-Carolina Senior Games. We had 31 participants participate in Pickleball this year. This was the first time Mid-Carolina Senior Games has offered Pickleball. All of our participants had a great time at this event. We did have a lot of spectators come by the gym and watch that day. I feel that we will have even more participants sign up next year. The Hope Mills Recreation Center offers Pickleball Tuesdays – 9:30 a.m. – 11:30 a.m., Thursdays – 1:30 p.m. – 3:30 p.m., and Fridays – 9:30 a.m. – 11:30 a.m.